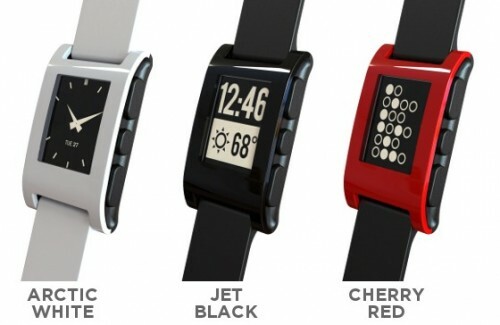 Pebble is an e-paper watch that supports iPhone and Android. It launched on Kickstarter this week looking for $100,000 by May 19th to enable them to produce the wacth. As I write this they currently have $2.8 million pledged with 33 days to go. Two days ago they had raised $1 million in 28 hours. To say this is poplar is an understatement. But what does it do? The specs are fairly limited – a 1.26-inch 144×168-pixel black and white e-paper display with backlight, Bluetooth 2.1 + EDR, four buttons, a vibrating motor and a three-axis accelerometer. However the clever part of this watch is the iPhone and Android support. Get notifications from your phone on your wrist, control music via the watch and see at a glance your running or cycling pace without reaching for your phone. The low spec’s also give the Pebble a planned battery life of seven days. There will be app’s that work alongside Pebble and a Pebble app for iOS or Android that allows you to pick from a huge range of watch faces. This is picking up from the iPod Nano watch craze and taking it to another level. There will be an SDK available prior to launch so developers can look to take full advantage of the Pebble prior to launch and there was (it’s sold out!) a hackers special option on Kickstarter that gave you a Pebble in August ahead of users so you can start to develop for it early. There has also been an announcement that the Pebble will now be waterproof rather than splashproof which is great. Prices start at $115 plus $15 for international sipping. I think thats a bargain for the Pebble but as Chris pointed out in the podcast it is a luxury – how hard is it to look at your phone? The geek in me loves it though so I’m looking forward to my Pebble shipping later this year.